Life in the Fast Lane 由 Eagles 专辑的一部分 "Hotel California" 并附带流派下 Pop,General. 发布了它 15 Sep 2009 根据标签 Rhino/Elektra. 版权所有holded者 1976 Elektra Entertainment..
She'd say, "Faster, faster, the lights are turning red." Haven't seen a goddam thing"
I think I'm gonna crash"
But you gotta pay him cash." 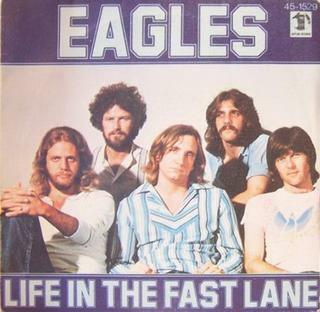 'Life in the Fast Lane' is a song written by Joe Walsh, Glenn Frey and Don Henley and recorded by the American rock band Eagles for their 1976 studio album 'Hotel California'. It was the third single released from this album, and peaked at #11 at the Billboard Hot 100. The song has remained a staple on classic rock radio stations since its release. It tells of a couple that takes their excessive lifestyle ('there were lines on the mirror, lines on her face') to the edge. On 'In the Studio with Redbeard', Glenn Frey revealed that the title came to him one day when he was riding on the freeway with a drug dealer known as 'The Count'. Frey asked The Count to slow down and the response was, 'What do you mean? It's life in the fast lane!' In that same interview, Frey indicated that the song's central riff was played by Joe Walsh while the band was warming up in rehearsals and Walsh was told to 'keep that, it's a song'. The song was also recorded for an MTV special as part of the Eagles 1994 reunion tour and 'Hell Freezes Over' album.